22 January 2018, Mr. David Kiang, Chairman of SRCIC Financial Committee, met with the delegates of European Bank for Reconstruction and Development (EBRD) in SRCIC Beijing office. 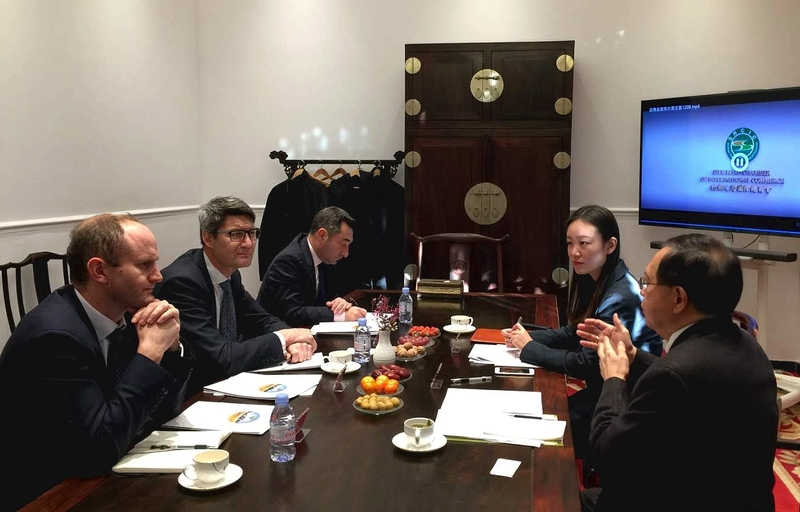 Present at the meeting were Jonathan Charles, Managing Director for Communications, Philip ter Woort, Director for Business Development, Richard Jones, Director of EBRD-AIIB Business Development, from EBRD and Emma Wei, Deputy Director of Membership Centre, from SRCIC. Discussion was centered on mutual participation in pragmatic cooperation opportunities and events. EBRD delegates expressed keen interest in the status quo of private sectors in the Belt and Road region, and they were impressed by the SRCIC efforts in partnering with strategic investors for big projects. They would like to be a partner for co-investment. Mr. Kiang also introduced the mechanism of Silk Road International Development Fund and its sub-funds. The idea of Silk Road (MENA) Fund and its potential Arab-China Development Bank caught the attention of EBRD delegation. Both sides agreed to establish a communication linkage for sharing projects information and investment opportunities, and further agreed to participate mutually in each other’s important events. EBRD delegates invited SRCIC to attend its 2018 annual meeting in Jordan during May 8 -10, 2018 and its Central Asian Investment Forum to be held in Beijing soon.